What's next for Industry 4.0 and advanced manufacturing? A new report considers the main trends, which include the use of smaller and more powerful robots and more proactive analytics. The report comes from CB Insights and it is headed "Advanced Manufacturing Trends In 2019." 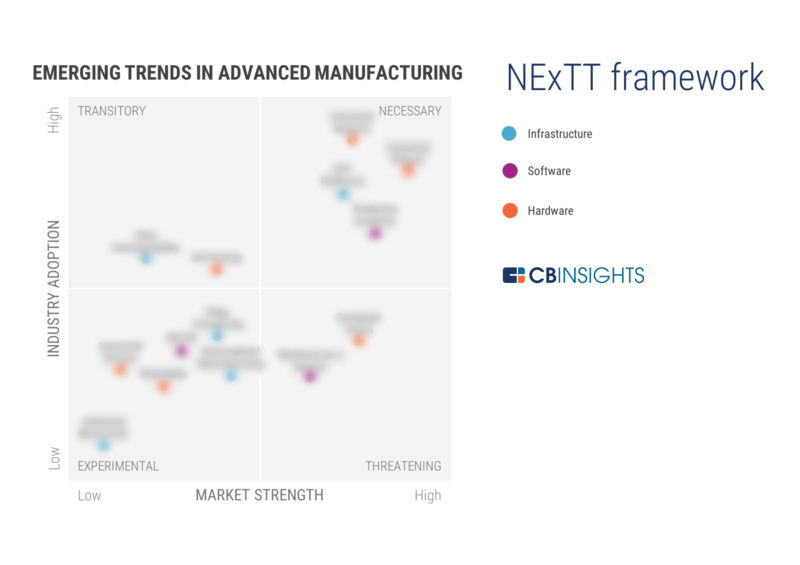 The report is an analysis of emerging advanced manufacturing trends using the CB Insights NExTT framework. This framework adopts a matrix approach to the analysis of industry trends using four measures: necessary, experimental, threatening, or transitory. The aim of the framework is to help businesses to assess different risk outcomes in response to different technologies and industrial strategies. Three examples from the report are expanded upon. In terms of the more advanced industrial trends predicted for 2019, these include the greater use of robots. Here robots are set to become more sophisticated, in terms of the machines becoming smaller, smarter, and more closely integrated with human tasks. Robots are set to grow across advanced economies. This will have an impact on employment. According to one review, robots are expected to create 15 million new jobs in the U.S. over the next 10 years, as a direct result of automation and artificial intelligence. However, 25 million jobs could be lost. With integrated, this represents a process in which people work near large, dangerous automated machines to one in which they work alongside—or even with—machine, according to Julie Shah, an associate professor and the director of MIT’s Interactive Robotics Group. Improvements with big data analytics means that instead of merely reacting to events, businesses can get ahead of them and employ predictive analytics to anticipate or forecast what is to come. An example comes from the website Smart Industry and it relates to asset optimization. Predictive analytics could provide an holistic approach to optimizing production assets across the entire lifecycle. This means spanning the initial capital investment to ongoing operations to subsequent capital investments to eventual retirement. Augmented reality offers a means to improve training by creating more realistic scenarios. Furthermore, this taps into the emergent workforce. Companies such as Wal-Mart and UPS have rolled out initiatives in virtual reality training, helping new employees master their jobs more quickly. A recent survey shows that younger generations are more interested in learning via simulation exercises compared with more traditional methods.